Steel carports, manufactured right here in Texas, are available in many different styles. Most of the time, we can put you in touch with a professional carport installer we’ve dealt with before or if you want to save some money, install it yourself. Absolute Steel carports and RV covers are designed differently for different environments and they’ll fit different budgets as well. We are known across America for steel carports and RV covers that fit into settings that most other steel structures just wouldn’t work. The material has a 10 YEAR WARRANTY against UV degradation and material flaws. Prices start at only $1095 cash & carry – shipping extra. Built much the same as the Standard or Sonoran carport, the Sierra has roof panels affixed so that the panels run from the peak to eave, shedding water and other weather better. For customers that live in an area having snow loads in excess of 35 psf, the Sierra is what we recommend. Having the panels attached as described above requires additional trim pieces such as ridge cap etc. And in order to run the panels in this fashion this steel carport requires purlins or cross members for those parts to attach to the roof. These extra parts will increase the cost a bit over the Standard or Sonoran steel carport. This is the style that started it all and is still going strong. These versatile steel carports and RV covers come in a range of widths from 10’ to 40’ and eave heights from 7’ to 15.5. 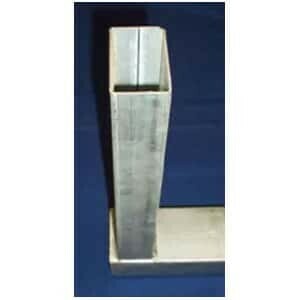 The main frame system is 2” x 3” galvanized tube steel and in the wider and taller models, we use a rugged 14 gauge 2” x 4” main frame system. 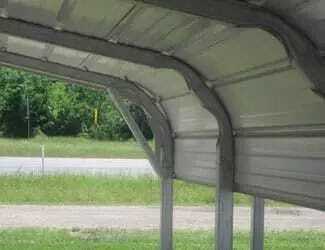 Sonoran carports feature a rounded eave and the panels are applied in a horizontal fashion. This means it’s very simple, if you wish, to extend the panels down one or both sides for extra protection against the Texas elements. 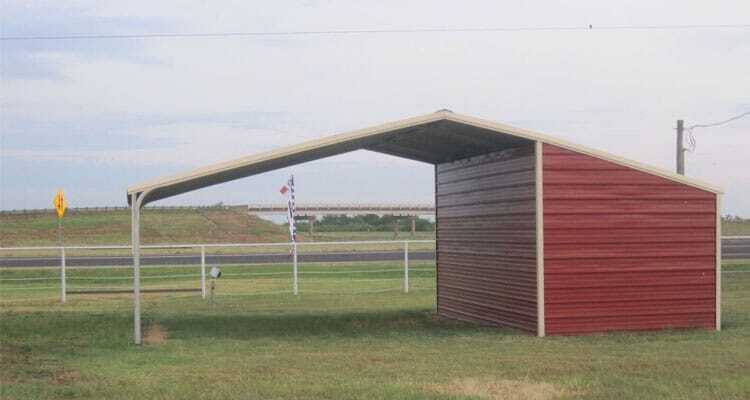 We offer the Sonoran carport or RV cover in 5’ On Center frames which will meet most Texas building codes and go down to 4’ On Center and even 3’ On Center for hurricane or mountain environments. 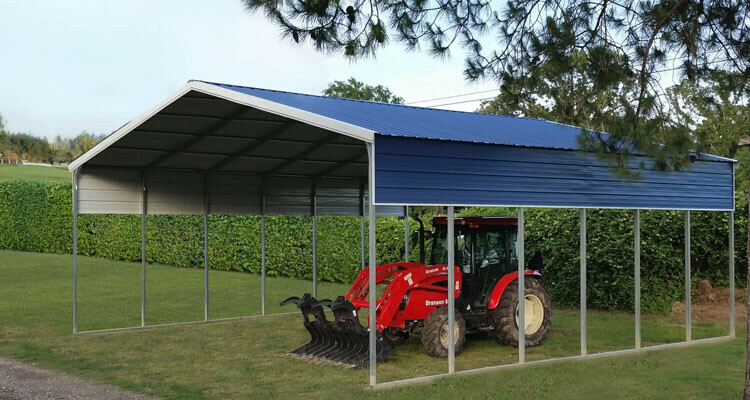 The Single Slope carport serves a variety of needs – equipment covers, livestock shades, apartment parking, hay storage and of course, just a simple two car carport. It features clean lines and an unobstructed profile so it’s a great covered parking structure when you’d like a carport that as invisible as a carport can be. We have designed and supplied these to job sites to cover one car and up to several hundred. It’s a simple structure and the easy installation reflects that. 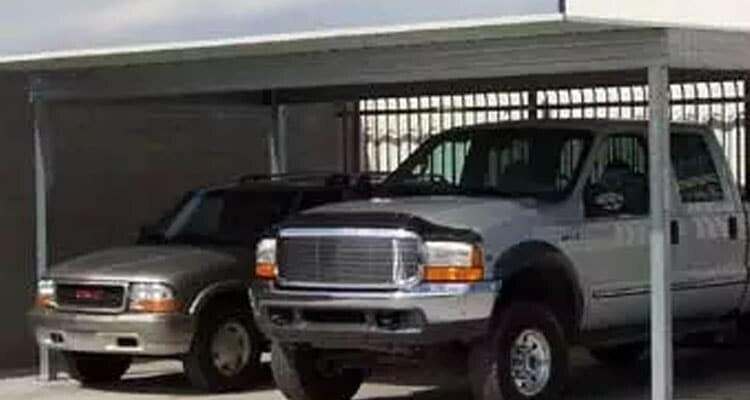 The Combo as its name implies is a steel carport structure with additional enclosed storage for odds and ends; its part carport and part building. The storage room can be put on the side or at the end as these two pictures illustrate. 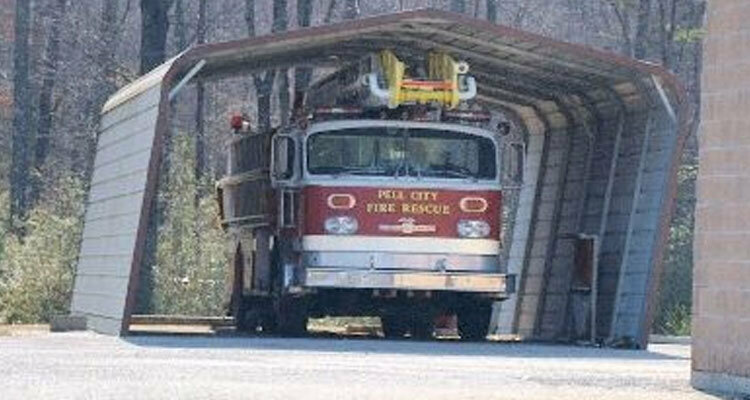 This is a great structure because one can avoid the costs of a garage and yet have some private storage or a workshop while getting some protection for vehicles. 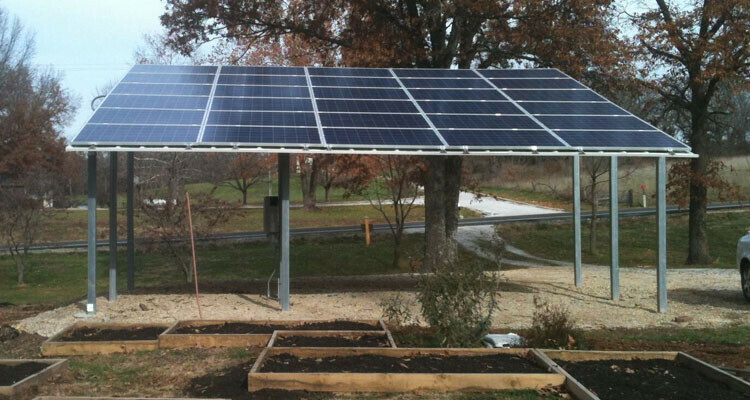 The panels can be applied horizontally like a Sonoran or Standard carport or like the Sierra offers – vertical. Your access door can be placed just about anywhere but we suggest you think that out so you don’t have to move vehicles to get into the storage room/workshop. The Teton carport uses our Grand Beam paneling which is made to look like shiplap siding thereby blending in to many residential environments. It features a 12” soffit overhang and unless closely examined one would think its exterior is wood. 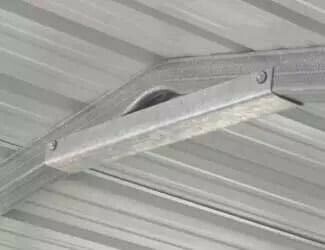 Due to the configuration of the overhangs, the Teton carport has the more trim components than any other carport we manufacture. 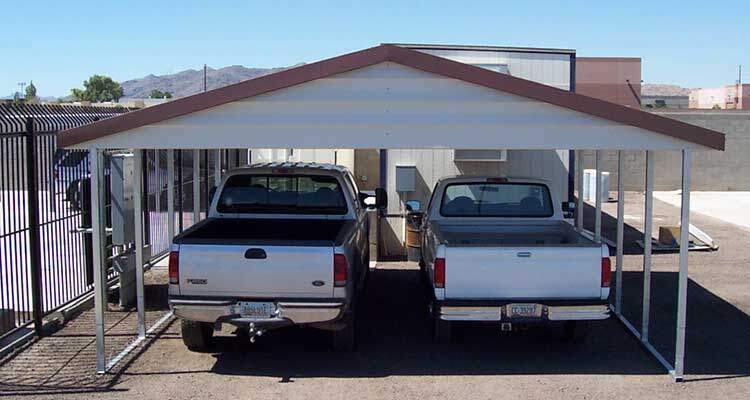 The San Tan carport is limited to only a few sizes. The San Tan carport most resembles the Sierra except it has less trim components. This style gives you eave overhangs which can vary depending upon the width of the structure but is priced less than other styles that offer the eave overhang due to less in trim costs. Installing the San Tan is very simple and not time consuming—basic common tools and 2 people and you can complete the job in a few hours. 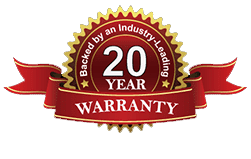 Our painted steel panels come with the best paint warranty in the business: guaranteed not to fade, chalk or peel for 25, 30 and even 50 years, depending upon which panel you choose. If just the paint finish lasts that long – how long do you think the panels will last? All our American made steel carport or RV cover frames panels are made with 80,000 ksi steel. We NEVER use steel panels rolled from Mexican metal that are painted with cheap, substandard automotive paint. All our RV covers and steel carports use the best painted steel panels that are also made in America – naturally. 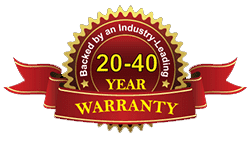 The panels we use on our metal building walls and roofs come with a 40 year limited warranty on the paint finish cracking, checking, peeling or losing adhesion. Additionally the paint finish is guaranteed not to fade, chalk or lose color for a period of 30 years. Read all details of the warranty here. Kynar 500®/Hylar 5000® resin-based paint coatings outperform virtually all other coil coatings in color and gloss retention and in resistance to chalking. Kynar 500®/Hylar 5000® has a superior 2-coat system (primer and color coat) that is unsurpassed in its resistance to damaging UV rays. These systems resist general air pollution and will not pit or whiten when exposed to moist environments such as rain, dew, fog, acid rain and chlorinated air. The service life of Kynar 500®/Hylar 5000® coatings and their long-term durability are unparalleled in the industry. These finishes are factory applied and oven baked by the coil coater. Kynar 500® / Hylar 5000® finishes are virtually maintenance-free and non-staining. If cleaning is required, either conventional detergents or solvent-type cleaners can be used. Kynar 500®/Hylar 5000®panels will look as good years from now as the day they are installed. All Kynar 500®/Hylar 5000® colors carry a 40 year limited warranty. Don’t worry about having exterior paint maintenance on a steel building from Absolute Steel! 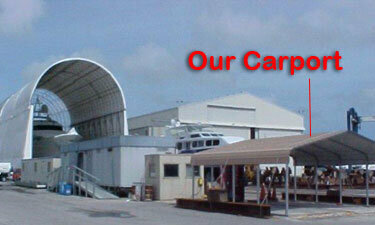 Our steel carports and RV covers are made only from the same US steel that we use in our metal buildings. We do this because that’s the only assurance we have that the steel meets engineering specifications. To do otherwise would be fraudulent and neglectful. Foreign steel, which is used by many of our competitors, is just like canned soup from Mexico – do you want to believe the purported ingredients? Besides using honest materials, we use larger sized steel, stronger steel and a more corrosive resistant steel than the competition. While this may not mean much to you right now, it will mean the world when the first storm hits. This will NOT be you…. Our buildings are engineered to stand up to the toughest weather. 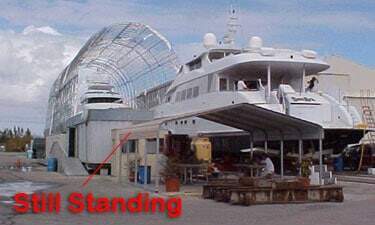 Now here’s one of our carports erected in south Florida that experienced Hurricane Wilma, one of the fiercest storms to ever hit the East Coast.Hurricane Wilma was the most intense hurricane ever recorded in the Atlantic basin. Wilma made several landfalls, with the most destructive effects felt in the Yucatán Peninsula of Mexico, Cuba, and the U.S. state of Florida. At least 62 deaths were reported, and damage is estimated at over $29.1 billion, ranking Wilma among the top 5 costliest hurricanes ever recorded in the Atlantic and the fourth costliest storm in U.S. history. This hurricane crossed Florida carrying winds of 110 to 120 MPH. Strong enough to be one of the top 5 most damaging hurricanes, but NOT STRONG ENOUGH to damage an Absolute Steel structure! 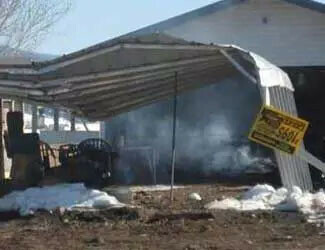 It means you’re getting the best possible value in a steel carport or RV cover that your money can buy. It means you’re getting the same integrity in American craftsmanship and materials that the “big boys” do. It means you’re getting the best warranty in the business. Our frame systems have a conditional lifetime warranty and the steel panels have a paint warranty against fading, chalking or peeling for 20, 30 and even 50 years depending upon which you purchase. It means you’re getting a better selection of models to choose from than you would from any other company in North America. 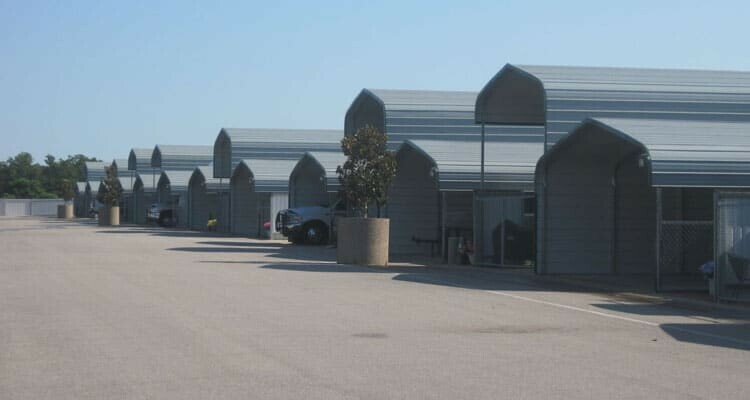 It means by choosing an Absolute Steel Texas steel carport or RV cover that you can order engineered plans—something that no other tubular steel building system manufacturer in Texas can do. 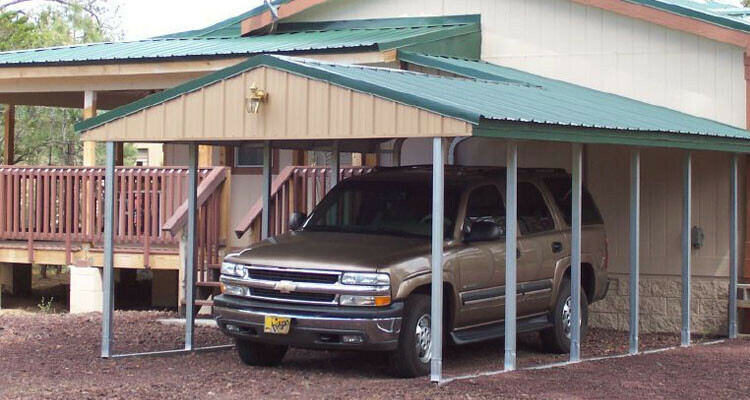 There are a few ways to anchor your Texas steel carport or RV cover frame system. The primary difference is whether you intend to anchor it to the ground or to concrete. (Engineering Available) Anchor our Z clip into the concrete so that it can be affixed to the base rail with 2—3/8ths x 33/4” concrete expansion anchors for each Z clip. The above applies to concrete slabs or runner footers. (Engineering Not Available) For years these structures have been anchored to the ground by doing nothing more than pounding the 30” ground anchor into the earth. It’s still being done this way with most ground mounts throughout Texas. Personally we would take the extra time (or money in the case of an professional install) to put the corners in concrete caissons as described below and if it was longer, we suggest putting one or two of those in-between the corners. (Engineering Available) Beside each vertical upright, you would drill a hole 30” deep by 10” around. 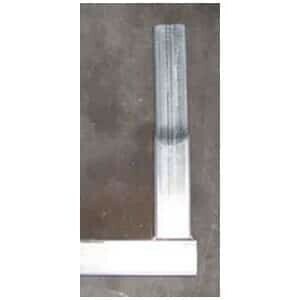 You would lay your attached base rails on the ground so that the anchor attached to the base rail goes into the hole. Fill with post hole concrete. 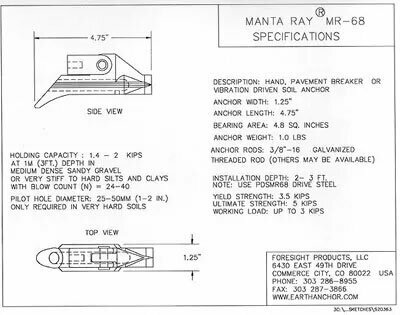 (Engineering Available) You can use a ground anchor called a Manta Ray or MR-68 ground anchor. It’s a duck billed clamp (opens when you tighten it up on the base rail) and is attached to a 36” 3/8ths all thread bolt. One then places a driving rod into the other hole which is on top of the ground anchor. You then drive this rod (with sledge or jackhammer) which pushes the MR-68 into the ground. Leave about 6 inches of the all thread bolt above ground. Now take a washer and nut and tighten up the all thread bolt that you’ve put through one of the holes in the Z bracket. 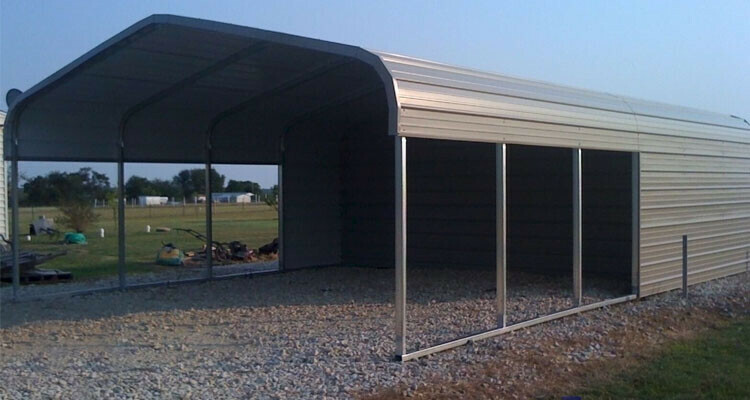 You won’t need engineered plans for any county in Texas for a steel carport or RV cover. If you live in an incorporated town or city, you need to check with your local building department. Texas municipalities can be pretty easy to deal with, and many people have satisfied their local town or city by furnishing drawings from us that show the sizes and strengths of the steel. These are never “wet stamped” by the engineer – if you need original wet stamped plans, that’s when we have to charge. 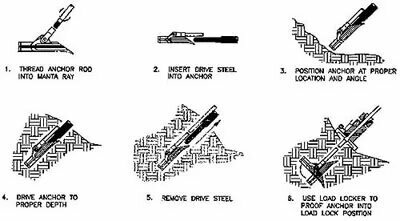 Three sets of stamped and sealed drawings along with three sets of stamped and sealed structural calculations by a licensed Texas engineer are $450. If you are intending to place the structure on “stepped elevations” due to site irregularity, the costs would increase somewhat. 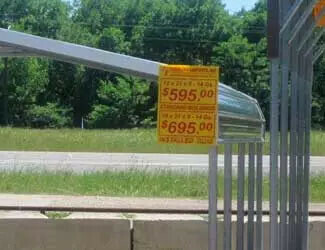 Please consult with your Absolute Steel representative for pricing if this is the case. Along with those engineered plans you’ll need a site plan showing the distance from the lot line and nearby buildings (fire access). Hand drawn is fine. 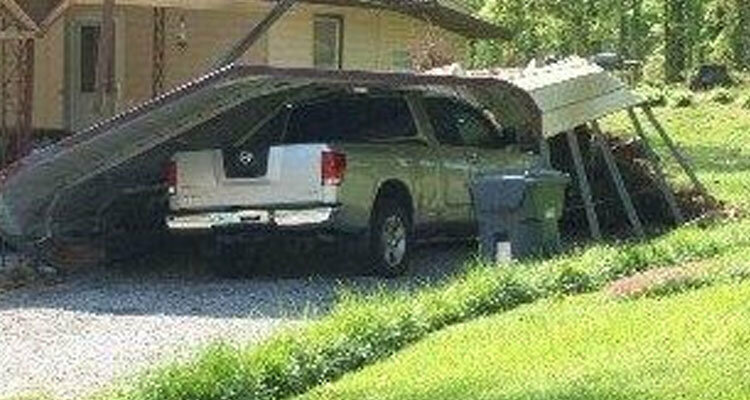 Before you spend your money on engineered plans, please check and see if you are in violation of any setbacks from the lot line or other issues that may prevent you from building your steel carport or RV cover where you intend. We don’t make money selling engineered plans so please do this. I don’t want to go through the permitting process even though I’m supposed to. Always check and make sure that the placement of the structure is allowable—distance from lot lines etc. 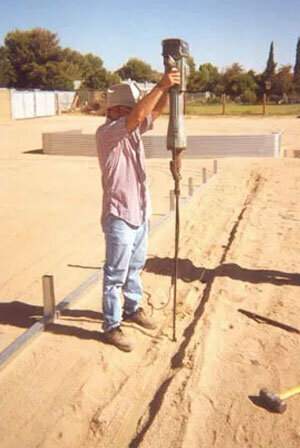 Document your footings, slab or caissons. Take a picture of your work documenting such with a tape measure to show depth. If it’s a footing, take a picture of the steel rebar in place. When you cover things up with concrete no one can tell what’s in there unless you have documented it. Know your neighbors – 95% of complaints comes from a neighbor. A little communication goes a long ways. Follow our installation instructions and do it the way we suggest. If you subsequently find your structure red tagged by an official, you can then order plans from us and go into the building department, hat in hand, and usually end up with a permit. We constantly work to improve our products and have done so over many years.  This page briefly illustrates the products we use in your Texas steel carport or RV cover frame and some information on why we fabricate things the way we do. 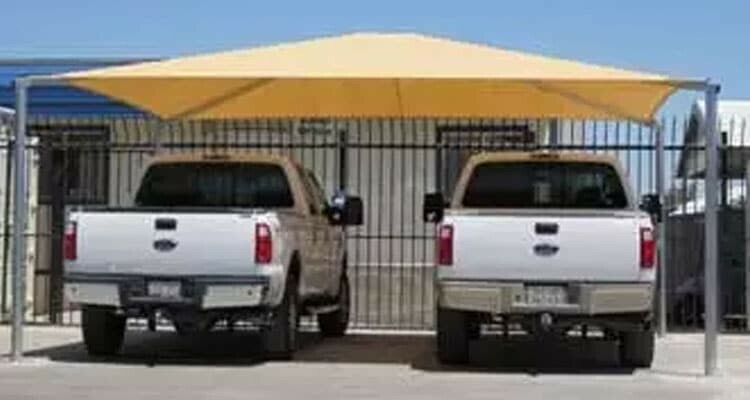 Please take a moment to understand the unique characteristics of our metal carports and RV covers. Any explanations or pictures of similar products are furnished only for comparative evaluation. You should know that Absolute Steel through its sister website Metal Roofing Source distributes metal roofing panels throughout North America and has done so for many years. We supply many companies and government agencies that have strict specifications with regards to the properties of the steel panels that are acceptable. 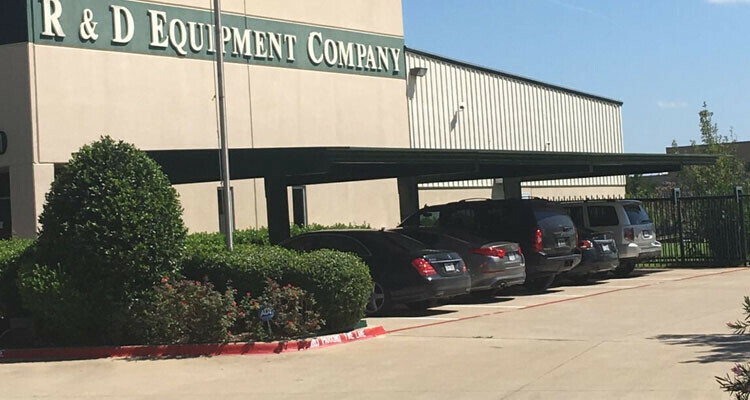 There’s a lot we have to say about the US steel we use in our Texas steel carports and RV cover frames but for our purposes here, we need to discuss our fabrication process and why we make parts the way we do. 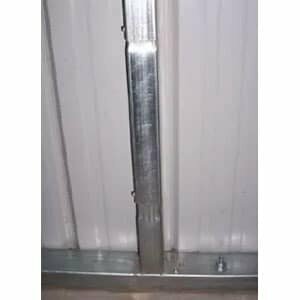 As the base rail system bears the maximum load of the structure itself, we do not use a swedged (mechanically reduced) piece of tube to fit up into the sidewall of your metal carport or RV cover. Instead we use single 14 gauge insert tube (insert tube is slightly smaller: 1 ¾” x 2 ¾”) for each vertical upright to slip onto. 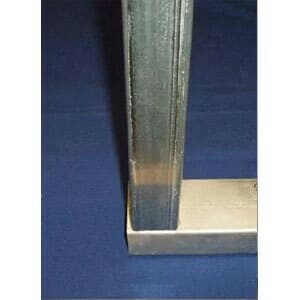 Why would we do this when we have the equipment to reduce/swedge the ends of 2×3 steel that we use throughout the frame and therefore could avoid this costly step? At the bottom, where condensation can collect, you have uniform and tight connections where it is most critical to keep moisture out. 12″ inserts give you plenty of adjustment capabilities in the event your site is irregular. Single piece connections that run from the base rail to the eave piece give you more strength on that wall. By not using multiple pieces for a sidewall, you have less assembly. That makes it easier on you or less money if you are paying an installer. Your steel carport or RV cover in Texas will have a wall that’s straight. You have parts that easily adjust without machining which adds up front costs. These two pictures illustrate a multiple piece sidewall. It stands to reason that the more parts you have, the less overall strength you’ll have. Not to mention the extra work involved! This is ours. There’s no additional parts to mess with, and by virtue of there being no connections, you will have a stronger sidewall! Plain and simple, our Power Bend is the most superior technology in the tubular steel building business; its way out in front of the competition. That’s quite a statement but with the following information and a few pictures, you’ll know why we can make that claim. First you need to understand that angles and curves—features you see on a car body are not just pretty, they’re necessary as they contribute to rigidity/strength of the steel. That’s why a piece of angle iron is stronger than a straight piece of steel strap. Crush Bend: This bend puts a tremendous amount of stress on one isolated spot. It’s the cheapest, most structurally unsound way to accomplish a bend with steel tube. And to make a bad job worse, most of the Crush Bend structures we’ve seen are made with inferior quality 2.25″ x 2.25″ Mexican steel. 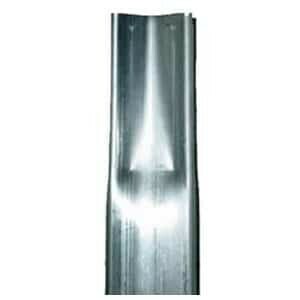 An uninformed person will buy this product which uses Mexican steel and Crush Bends for both the peaks and eaves. The price is attractive except when you consider you’ll be replacing it every year or two. 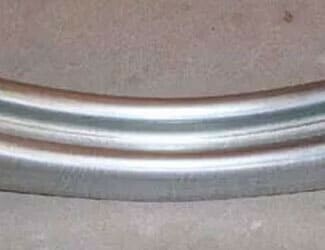 Notice the use of two crush bends, that’s because the Crush Bend is so radical it would tear the steel if one tried to make the necessary radius with one bend. As a side note, one panel screw used per side on a joint is simply inadequate and dangerous – and this is a sales model! 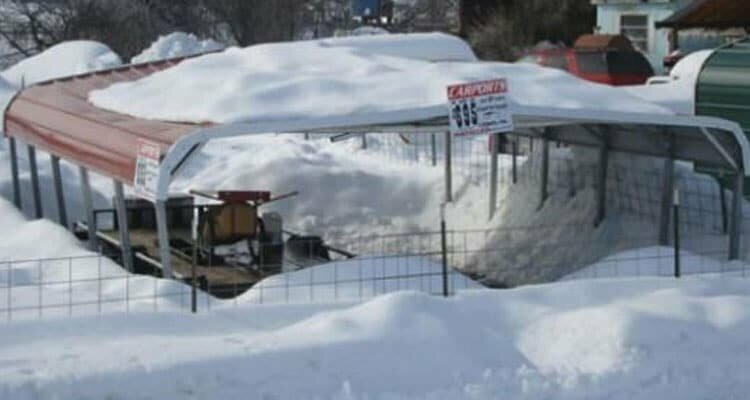 Apparently this carport is still for sale? Pay particular attention to where this structure gave in—right at the stress points; the crush bends despite any U channel bracing. This one claims to have “a stronger bend transition”. To debunk that statement one only has to look at the two pictures below. 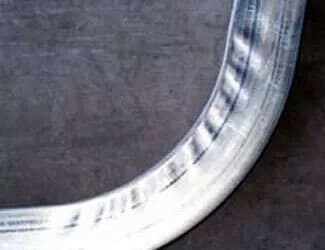 The lineal pattern on the inside and outside of the steel tube that underwent the “mandrel bend stretching process” is caused by stress lines in the steel. With a mandrel bend the steel is stretched and the stress marks are visible—and that’s what you can see. This is not good. The Power Bend adds six more surfaces with condensed curves to strengthen peaks and eaves – remember the car body and why it has contours to its surfaces? The peaks and eaves need to be built that way because steel carports and RV covers are prone to stress at those points.